Our latest feature, "10 Songs, 10 Stories," continues today with a submission by artist Jon DeRosa who recently released the full-length, Black Halo (purchase it here). DeRosa has embraced a "West Coast" sound with his latest batch of songs; let's have a listen to the first two singles, “Coyotes” and “High & Lonely,” now. 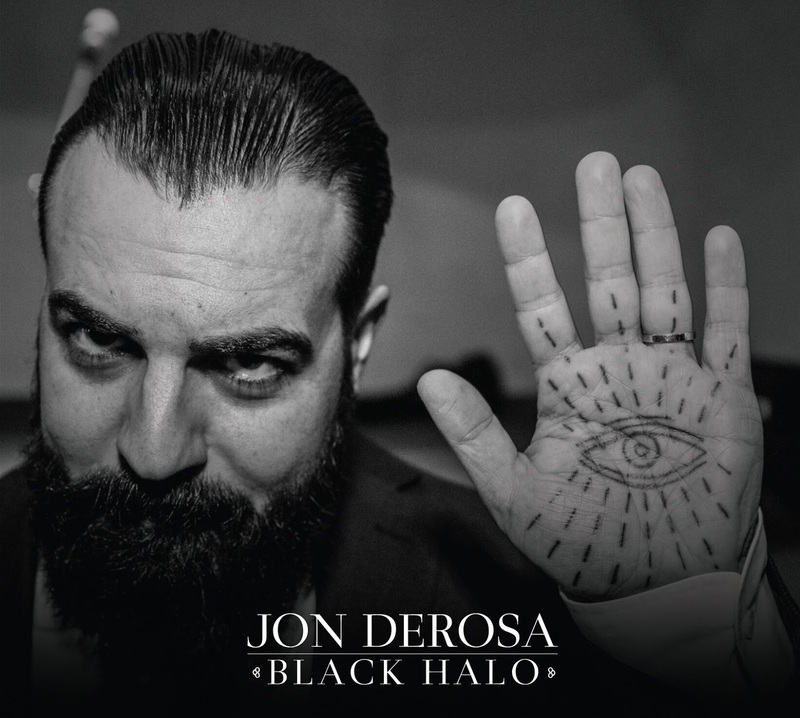 Please enjoy Jon DeRosa's stories for each song from Black Halo below! One of the first songs written for Black Halo, and the origin of the entire supernatural theme of the album. I wrote this upon returning from Europe after touring with Lydia Lunch. Before leaving for tour, I had picked up a very extensive Roy Orbison box-set that I listened to constantly for those weeks on the road, and I’m convinced that’s where all the rhumba rhythms and a lot of the vocal inflection and melodic ideas for the entire record stemmed from, this song perhaps the most prominent example of that influence. The song is written from the perspective of someone who lost his beloved at a very young and impressionable age, and has since tried to find things in this physical world to live for, but to no avail. And so at night he retreats into this alternate dimension, creating a world where they can still convene. The title “Fool’s Razor” refers to the dilemma of asking universal questions, knowing there’s the possibility that the answers you will be given are not the answers you want to hear, if any answers even exist at all. It’s about wanting something so badly that manifest it with your mind and with your heart. And it’s about knowing that nothing is ever really gone, that every moment we’ve ever lived and every person we’ve ever lost, is still very much alive in some alternate dimension. I had written the music for this song in Los Angeles in the Summer of 2014 while on a serious Buddy Holly kick. I had been really enjoying a lot of early rock and roll, and being a new resident of Southern California, was listening with an ear to how he in particular (along with Ritchie Valens, of course) incorporated a lot of Mexican influence into the new American rock sound at the time. I built this tune around a guitar riff and started orchestrating around it. I started putting lyrics to it and if I recall, the original was called “Gold and Silver Tears,” all about this girl, and how when she cried “gold and silver tears,” her eyes looked beautiful. But the meter was so weird the way I had envisioned the lyrics that it just never felt right. I think older siblings love to tell younger ones, "You don't remember, you're too young," which is an unanswerable claim to unlimited authority. It would initially seem like a bit of a departure from much of the album theme, however when you consider that it’s rooted in fantasy and this idea of someone sort of creating this alternate reality because of unhappiness in a physical reality, it actually makes a lot of sense within this collection of songs. A truly West Coast song, because I don’t believe I’d ever really seen or thought about a coyote until I moved to Los Angeles. But in reality, the song itself is not about coyotes. It’s about living life in alignment with nature, opening up to the spiritual communication that is all around us, acknowledging that all the information we need is often within us, and living freely with wild abandon. It’s about looking to nature for answers and direction and not letting fear cut out our hearts. Musically, I’m always looking for ways to harmoniously combine my love for early 1960’s pop music and also my affection for early 80’s post-punk, which is not always a seamless union. I think this is perhaps as close as I’ve ever gotten to integrating the two successfully. This one was penned during the first weeks tending bar in a very old building on a remote section of the Brooklyn waterfront. The place had just opened and was not very heavily trafficked yet, especially from 12 AM – 4 AM, where at times there would not be a single customer in there. It was always an interesting arc for me, to see all the dates and the inebriated men and women, the amorous advances and festive excitement in the early part of the evening, leading into that dark stillness and emptiness, where only the echoes of the night’s previous fun could be heard. This was just after I lost my grandfather, so at closing time I would pour a Dewar’s for him and leave it on the bar, and one for myself and just kind of talk as if he were there. And then I started to imagine, what if all the ghosts that had frequented this place over the years came out after closing time, and took up seats at the bar once again. Truthfully, I am quite sure that bars are often full of low-level spirits, who can’t seem to let go of their physical vices in order to ascend to more heavenly planes. But my belief in helping souls move along is to offer love and acknowledgement, something they often lacked in their physical lives. And so the wee hours I spent alone behind that bar no longer felt so alone, as I poured several glasses for the former residents and we enjoyed a drink until it was time for me to leave. Most definitely this song is a tribute to a man I hold in the highest regard, the “Sleeping Prophet,” Edgar Cayce. Cayce was a remarkable human being who was able to put himself into a self-induced sleep state, under which he was able to access the Universal Consciousness and Akashic Records, a non-physical compendium of all thoughts, events, facts and emotions ever felt by anyone who ever lived at any time on this Earth. He used this ability to diagnose and cure thousands of people, even though he had no medical training whatsoever. The song itself comes from the perspective of someone having a bit of a difficult time comprehending these spiritual teachings, and perhaps grappling with issues of faith and one’s own connection to the Divine. The phrase “lonely sleep” refers to the obstacles Cayce faced in learning to accept his gift, but also the feeling of loneliness that one may feel in this physical plane when pursuing a spiritual path, as it certainly sets one apart from others. And when frustrations arise for someone who is unable to progress in a spiritual path, finding themselves stuck somewhere between the mundane and the enlightened, it can be a profoundly lonely place. I wrote this song with Carina Round during our first ever meeting, that’s how natural it was to work with her. I was an admirer of her voice from the first time I heard it, and it was really a pleasure to discover that she was also just a really lovely human being as well. I had already written the guitar part, and it was just so delicate that I felt it needed a feminine voice. I’ve always enjoyed male/female duets, where one’s light tempered the other’s darkness (PJ Harvey & Nick Cave come to mind first), and that’s what I hoped to achieve here. While Carina and I never really discussed the true meanings behind the words we were putting to paper, I see this song as two lovers singing to each other, where there is only true love between them, but also a certain amount of chaos or self-defeating paranoia in one of them that imperils what they have built together. My favorite line is one that Carina wrote “Like a moth to the moon / You will disappear soon / As I call to you.” So perfect and so visual, summing up so many things in such a beautiful way. Here is a song that I began working on in New York, but just couldn’t get the feel right until I revisited it in Los Angeles. The song revisits the ongoing theme of feeling profound disconnection in this physical world, and longing for the companionship of someone who was passed over to the other side. This interpretation, however, is a direct call to the spirit world, asking for the soul of this person to “knock once for ‘yes,’ if you are near.” In the end, there is a peace in knowing this soul is still “with” them, as implied in the verse leading up to “Now I am everywhere.” That soul is personified by Carina Round, providing the call to “close your eyes,” over and over again. Musically I really owe Brad Gordon a huge credit on this because, while I conveyed the brass melody to him, he built a truly majestic arrangement around the themes I provided. For me, it’s a bit of a tribute to Joy Division, specifically the lone horn melody in “Love Will Tear Us Apart,” and the lone analog synth squiggle toward the end is the soul transcending the body. In a way, this is the companion song to Fool’s Razor, in the sense that it deals with a similar theme: The inability to face the day and get on with one’s life even many years after suffering a loss. The attitude is different here though, less nostalgic and romantic, and more jaded, hurt and angry about being abandoned. Still I thought it was quite funny in a way to wonder “how cruel can someone be” about a dead lover visiting you in your dreams. The general idea was loosely based on the Ambrose Bierce story “The Difficulty Of Crossing A Field,” in which a man disappears into thin air while others look on in disbelief. This song, however, actually draws from my own personal feelings about the nature of life, the message being that this physical world is an illusion, and this life is a dream. When we die, it is like awakening from a deep sleep. While all seeds are sewn in this plane, it is not where we reap the harvest.